Middle childhood – from ages 6 through 12 – is a time of enormous physical, emotional, and cognitive growth. Children become more conscious of themselves and their identities, are more aware of social customs and interactions, seek more freedom and autonomy, and expand their capacity for abstract thinking. Along with these rapid internal changes, children’s external environments are also changing. Classroom environments become more rigorous, adults’ expectations of behaviour and performance increase, and unstructured leisure time can decrease. The rich complexity of this developmental stage requires an equally rich way of measuring well-being. 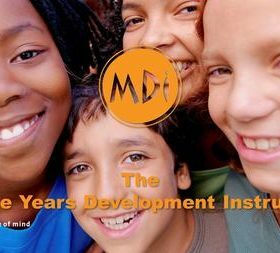 For this reason the Middle Years Development Instrument (MDI) was developed. The MDI is a self-report questionnaire that was completed by children in Grade 4 and Grade 7 in our district. It asks the students how they think and feel about their experiences both inside and outside of school. Both the Grade 4 questionnaire and the Grade 7 questionnaire include questions related to the five areas of development that are strongly linked to well-being, health and academic achievement.